Customer Experience (CX a.k.a CEM) is the sum of all experiences a customer has with a supplier of goods or services, over the lifecycle of their relationship. This covers several phases including awareness, discovery, attraction, interaction, transaction, use, service, cultivation and advocacy. These are not simply sequential, but rather a continuum of phases existing within the context of CX. CX is not something you just bolt on to your existing enterprise architecture. So why does CEM/CX matter? The simple answer is for retention of your existing business customers. Your competition is a click away and studies show people are 3 times more likely to tell others about a bad experience than a good one. People declaring a bad experience with you are ripe for your competition to steal. 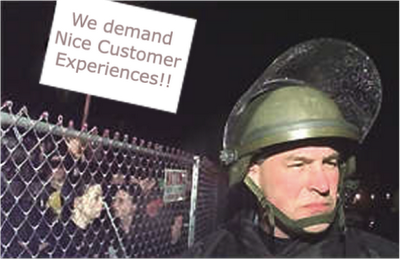 With social media, bad CX stories can escalate virally and ruin the reputation of a business in weeks or even days. People notice BAD experiences and get emotional! They want a good customer experience. Yesterday I installed the 5.5 version of Creative Suite Master Collection. To my dismay, there was no 5.5. version of Soundbooth, which I had uninstalled as per the instructions. To recap, on Mac OS X it is very important to use the Uninstall feature for earlier versions of CS instead of merely dragging them into the trash. After installing CS 5.5, I grabbed the media to re-install the previous version of Soundbooth (CS 5), which I use regularly for Duane's World. During the installation, an error message came up stating something like "Unable to continue - close the following applications: AdobeResourceSynchronizer". I searched for a while and did not find any application with such a name but did find the process. If you run across this issue on a Mac, launch the "Activity Monitor" (it is under /Applications/Utilities/Activity Monitor.app). By default, the activity Monitor will only show Active Processes and you will not see the AdobeResourceSynchronizer. In order to stop it, you have to select "All Processes: (Step 1 below), then highlight the process "AdobeResourceSynchronizer" and then hit Quit Process (Step 3 below). After that you should be able to resume the installation of Soundbooth. When done, restart your Mac and the AdobeResourceSynchronizer will heal its wounds and restart. Flash and the City - NYC Better than Ever! 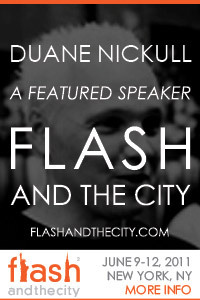 This year once again I will be speaking at Flash and the City in New York, June 9-12. This year I will be teaching a 6-hour hands on code camp for anyone wanting to become a Flex or AIR developer. The event website is here. Please register early to ensure you get a space. In addition, Flash and the City will be part of Internet Week NY, a very popular and highly marketed festival that attracts citywide attention. Internet Week is a week-long festival of events celebrating New York's thriving Internet industry and community. Internet Week New York is presented by the International Academy of Digital Arts and Sciences in cooperation with the City of New York and The Mayor's Office of Media and Entertainment. The full courseware that Scott MacDonald, Gary Gilchrist and I delivered during MAX 2010 is now available online. Anyone may use this material as a self-paced tutorial to understand how Java Developers can extend the native capabilities of Adobe LiveCycle ES. EXERCISE 2: DEVELOPING THE CUSTOM COMPONENT . Task 4‐2: Programmatically invoking the EncryptManyDocuments process.